In my ongoing quest to get an free, lightweight and fast download manager with remote access ability for Raspberry Pi. I settled for Transmission to get torrent downloading and pyLoad for ftp/http downloading, however both of them have issues under limited resources of Raspberry Pi and had frequent crashes now and then. After, a lot of research, tweaking and testing - I had finally found the best option for a perfect lightweight download manager on linux as "FatRat". 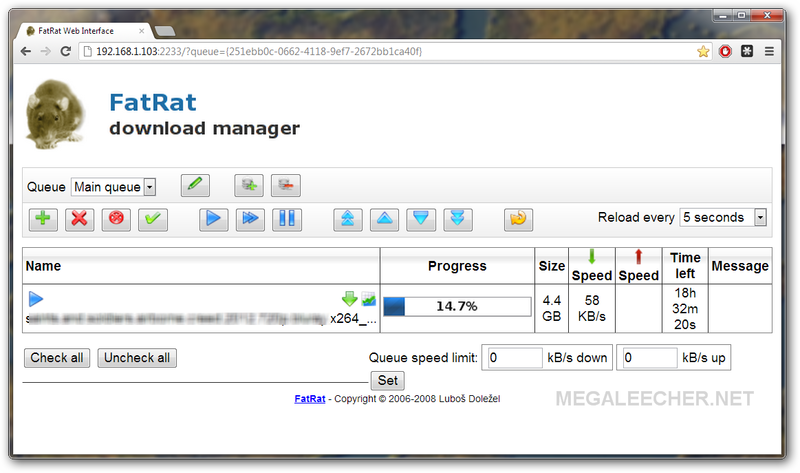 Despite the name being FatRat, this open-source download manager for Linux is written in C++ and is slim on requirements, fast on performance and comes with all the bells and whistles one would need from an modern download manager including Segmented HTTP(S)/FTP downloads, FTP uploads, torrents and a super-fast web-ui for remote access. 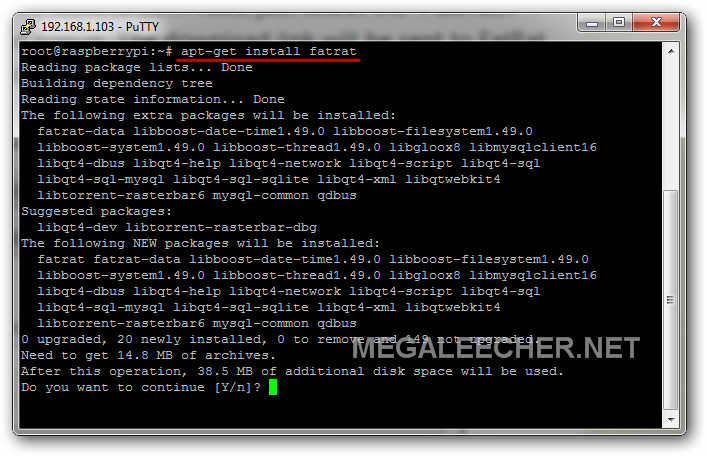 Use apt-get install fatrat at terminal and complete the installation process. Once installed, FatRat can be launched in headless mode using the fatrat -n (--nogui) switch. To enable the webinterface from command-line use - fatrat-conf -w remote/enable=true remote/port=PORT remote/password=PASSWORD. Now to control FatRat remotely, launch the web-browser and navigate to http://YOURLANIP:FATRAT_PORT. FatRat web-inteface is super fast and feature rich. You can add new downloads. Browse a location to save downloaded files. 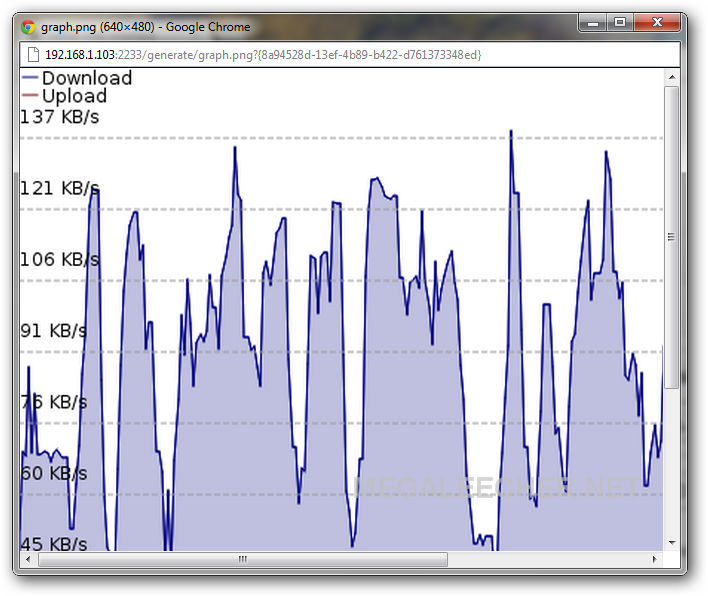 Check download stats and control status. If you are using FatRat on a regular Linux desktop environment or over VNC, you can use the excellent, powerful user-interface for advance options and features. FatRat is dated, here is a better option. FatRat is rather dated and has not been updated in a long time. I am actually a very big fan of uGet from http://t.co/iCOUXb7g BUT for your purpose with the Rasberry PI the lightweight aspect is the most important and that might not work very well for you as it is lightweight but it does not offer webbased remote access. Aria2, on the other hand, is a command line exclusive app that is incredibly lightweight and fast...yea I know, terminals...but with Aria2 there is a VERY NICE webbased gui that can be remotely accessed...well remotely on the same LAN but that is what I think you want anyway based on your screenshots. Thanks for the valuable input, I did tried aria2 and liked it. However finally, I settled for lftp as it is highly scriptable and a custom coded script sufficed my download automation needs. hello, sorry for my English. I wonder if it is necessary to enable any web service in rasp because I'm not able to run the command fatrat-conf, I can run the putty fatrat only can not I access the brownser. What do you guys say - am i'm missing some thing? Some thing wrong with my setup? After testing everything out there, I would definitely go with only and only "aria2" as an download manger for Raspberry Pi. It does download the metadata first and then starts downloading the contents pointed inside it, maybe you should give it more time. 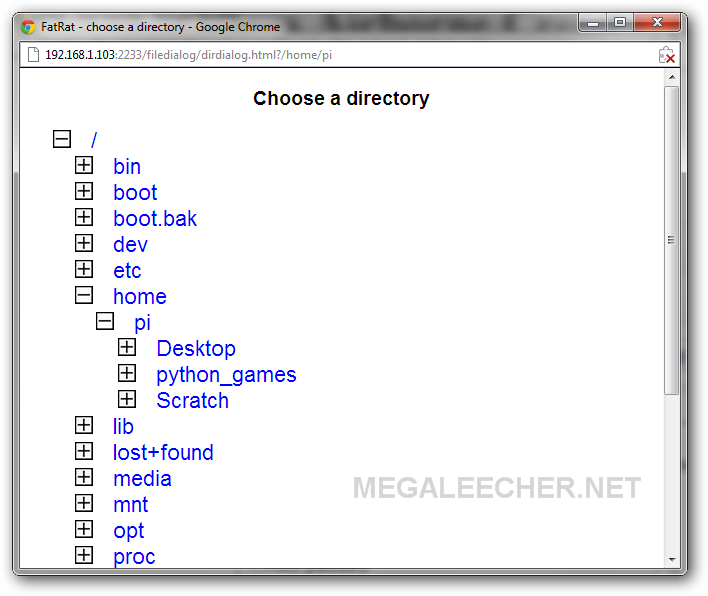 I would also strongly recommend you to compile and use the latest version of aria2 following this guide - http://www.megaleecher.net/Best_Download_Manager_For_Raspberry_Pi. I have now managed - after 6-7 hours to get thing up and running....i think... But I still can't make Aria2 download a magnet link or a torrent? I prefer not to use the command promt - which tool or Web UI do you use...I have installed Aria2 v. 1.16.4 and it does not seems to work with "Aria2 Remote Control", this version of Aria2 also says in an error msg. that it does not support https and therefore i can't install: sudo aria2c --dir=$DOWNDIR -o webui-aria2.zip https://www.github.com/ziahamza/webui-aria2/zipball/master either :( and http://ziahamza.github.com/webui-aria2/ cant download these type of files...?? What do i do? I really dont understand if Aria2 should be the best dl manager - why every thing i soo complicated...? I am using the http://ziahamza.github.com/webui-aria2/ and it works well. The hosted version is undergoing some major changes, so maybe try again. Do you know any other interface which works? Do you use special syntax regarding magnet links? Can i see an example of yours? 1). Web interface http://ziahamza.github.com/webui-aria2/ is working, make sure it is connected by configuring in Settings->Connection Settings. 2). Try this in aria2 web client-> Add -> By URIs -> Paste magnet:?xt=urn:btih:674977bfb4fe2441125e7e6b6fbc60aabc58cdea&dn=ubuntu-12.10-desktop-i386.iso&tr=udp%3A%2F%2Ftracker.openbittorrent.com%3A80&tr=udp%3A%2F%2Ftracker.publicbt.com%3A80&tr=udp%3A%2F%2Ftracker.istole.it%3A6969&tr=udp%3A%2F%2Ftracker.ccc.de%3A80 and click Start. 3). The other best option is FatRat followed by Transmission Torrent Client. I would love to suggest this tool for you and it's IDM - Internet Download Manager - it's one of the best download managers out there. i thought i had installed it earlier in the evening, but when i typed fatrat into the dash, nothing happened.even though everything appeared to be installed. i use ubuntu 14.04 lts, 64bit. with unity DE. am new to allthis, so i am bewildered. root@paul-home:/home/paul# E: Unable to lock the administration directory (/var/lib/dpkg/), are you root? 0 to upgrade, 1 to newly install, 0 to remove and 34 not to upgrade. Need to get 0 B/807 kB of archives. After this operation, 2,573 kB of additional disk space will be used. Package tor is not installed. i very rarely seem to get very complete updates. This seems to be some issue with your packages, your best option would be to post your query here - http://superuser.com/ referring this article so LInux guru's can help you out. I have hear a lot about this software but some of my concepts are not cleared. The revoew you have published here is precious and it is perfect download manager tool for linux platform. What's the username ? No matter what i tried it didnt worked. What's the username for Web interface? Try “fatrat” or “admin” as usernames when logging in, I now personally prefer aria2c (http://www.megaleecher.net/aria2_For_Raspberry_Pi) over FatRat - do give it a try. Which one is good IDM or FatRAT? FatRAT amongst the two and aria2c otherwise. Is there a option to download torrents using RSS feeds ? The feature description says "RSS feed support + special functions for TV shows and podcasts", so I would say it do seem to support torrents via RSS feeds.